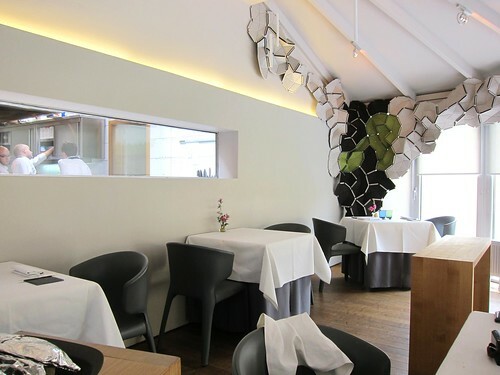 Lunchtime is near and we are awaited at l’Air Du Temps, the 2 star restaurant of chef Sang Hoon Degeimbre. Again, I am glad to join my friends of Gastros on Tour for this meal. I am especially excited because it’s my first time at this restaurant I have already heard and read so much about. Sang Hoon, I already met him before when, together with his friends he was attending OFF festival in Deauville as a visitor. A relaxed and charming guy with lots of humour and love for good food. 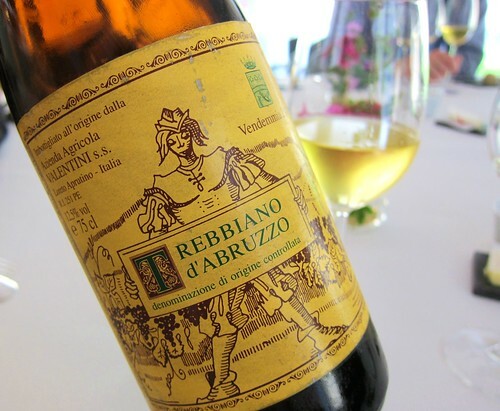 A trained Sommelier at first, he opened his restaurant in 1997 and quickly made himself a name for being a virtuose in the field of molecular cooking. But from what I can tell, and now I’m talking after having had this lunch, he’s someone who uses these techniques with very good measure, resulting in dishes that make a lot of sense in terms of taste. He also uses them as a means of finding new pairings or making new combinations possible. 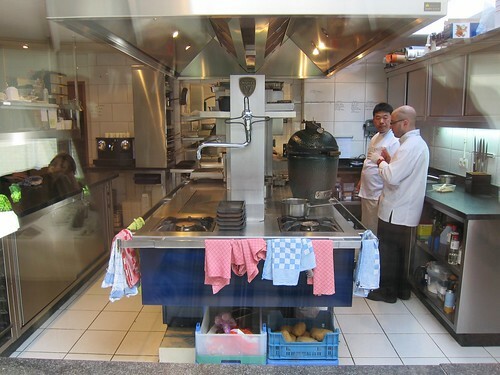 Sang is a meticulous analyzer of flavors always searching for new matchings. Expect the unexpected. But there is a second big pilar to his cuisine, and it is equally if not even more important. 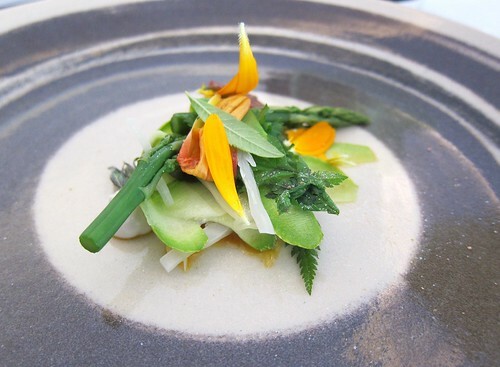 It is the local sourcing of his cooking ingredients and for this he is counting on his friend Benoît Blairvacq who is organically growing countless numbers of almost forgotten or lost varietals of vegetables and flowers. 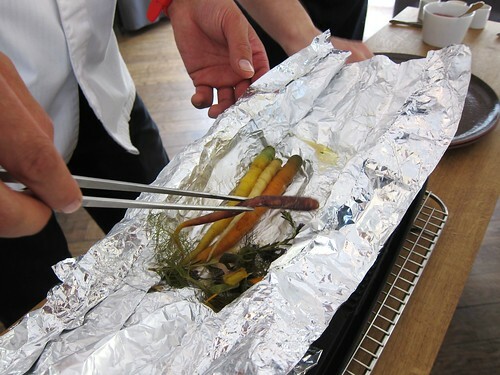 This gives Sang Hoon Degeimbre’s cuisine a very natural touch. 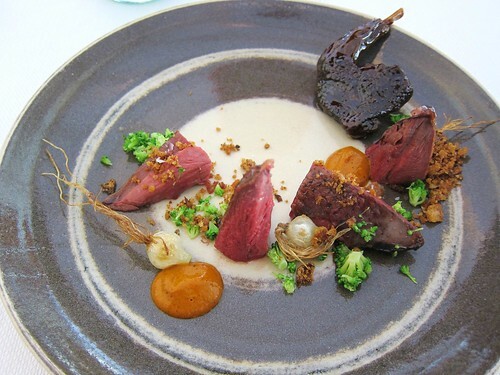 Same goes for meat and fish where the best example is the delicious pigeon from Waret. 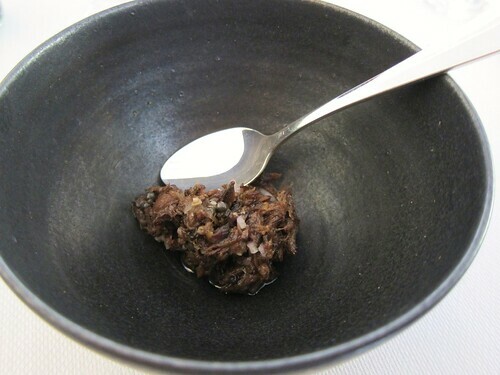 And then, there is of course the influence of his Asian and Korean heritage which is very present in many of his dishes. If you take all these aspects together, you have a style or let’s say a personality of cuisine which at this level is quite unique in Europe and probably as well in the world. Well, that’s lot of praise already for the beginning of a blog post… so let’s get back to the start of this meal. A meal that was announced by our friend L. as a quick lunch with maybe 2 or 3 courses… Ahem, see for yourself what we ended up having. 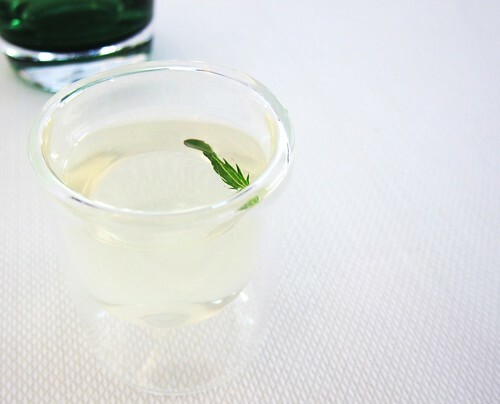 Water of Dracocéphala – intense, acidic, alarming your palate! Sheet of cereal and onion bread – Savory crunch! 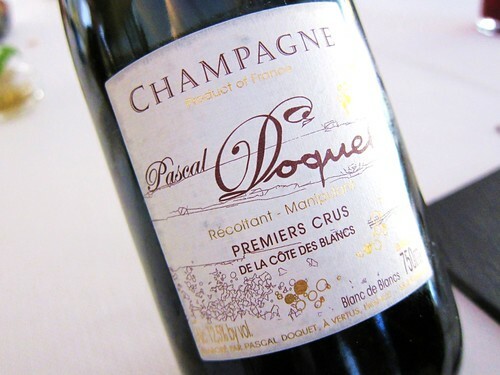 Pascal Doquet Premiers Crus, a small producer’s Champagne. Pale robe, nose of yeast, brioche and fresh cut pears. Dry and refreshing on the palate with a good perlage. 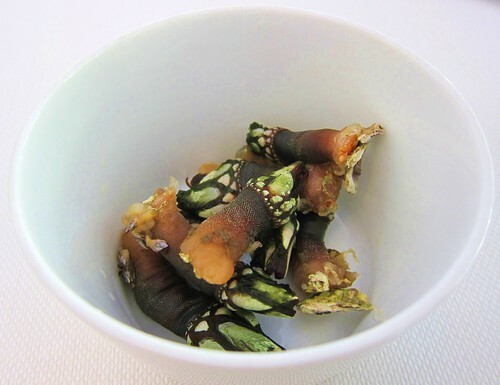 Percebes from Galicia – a little manual dexterity is required to peel out their delicious and juicy flesh. From the beginning it is clear that Sang loves to let his patrons participate. An interactive and very dynamic meal is starting. From the vegetable Garden – Fresh greens and leaves coming from Ben’s garden. Ssambap – Korean “yumminess” with ingredients you’d probably won’t encounter in korea ! 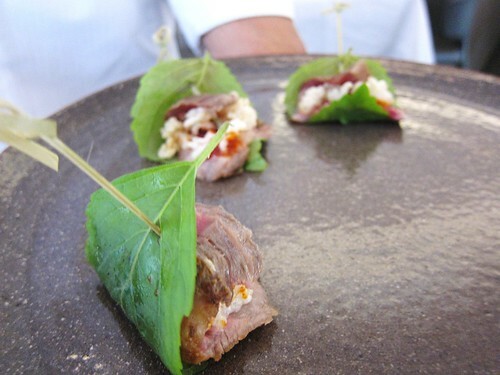 Tender Iberico pork filled with crispy puffed rice and a mildly spiced Kochujan paste. The leaf adds a fresh note. A bite that feels like luxurious fusion-fast-food: great! 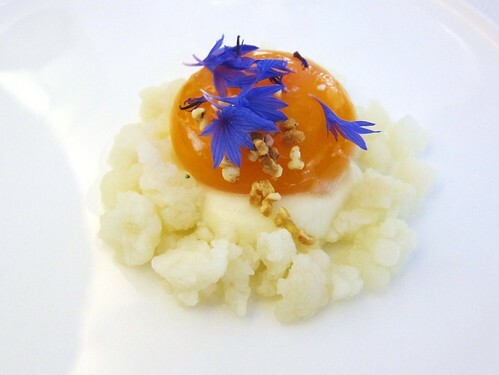 Oeuf Mega Trois et choux fleurs – a stunning beauty and a play on textures and onctuosity – but taste-wise maybe the only dish I was missing something: a condiment? or are my tastebuds just not sharp enough? Ishiyaki – named after the Japanese stone grills- And this is exactly what we have in front of us. 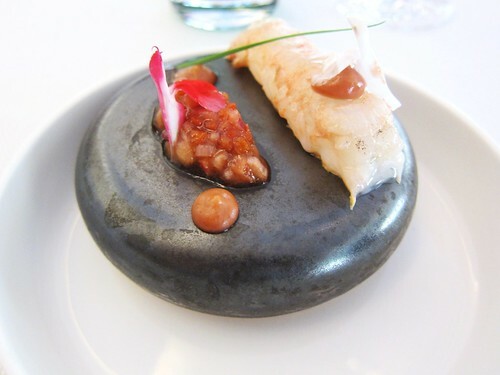 A hot stone on which a beautiful raw piece of Langoustine is slowly cooking. 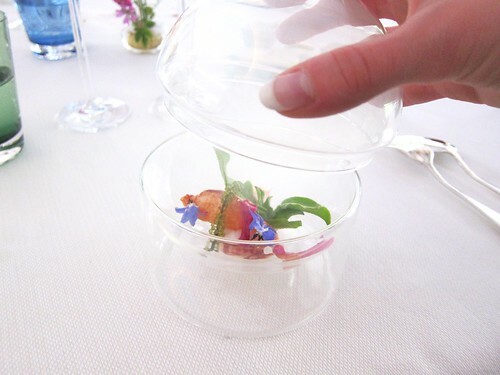 Next to it, a chewable strawberry Gaspacho with some tomato that adds slight fruit and acidity. A harmonious dish and yet the fact that the patron has to participate makes it again very dynamic. So simple and sophisticated at the same time. Creativity. Bretagne – named after the lobster’s origin. A very pure and sensual dish. 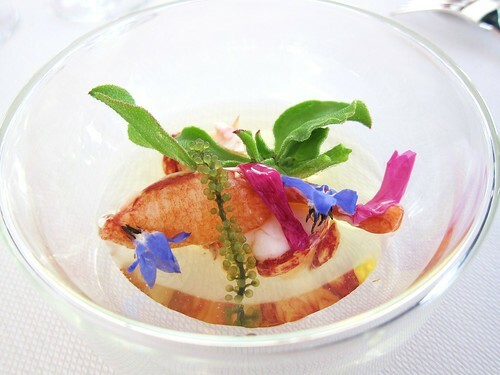 There is smoke at first, reminding incense, then the slightly sweet and tender meat of the exquisite homard bleu, the fresh crunch of the iceplant leaves and the iodine explosions of the seagrapes, the delicate flavor of the flowers and finally a fresh Umami hug from the cold Dashi. A masterpiece of purity. 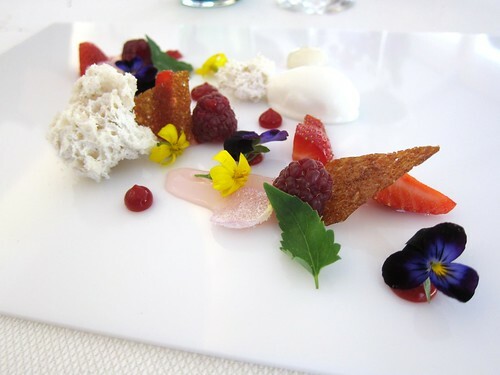 Koshi I Kari – named after the Japanese premium rice used in this deconstructed Sushi. 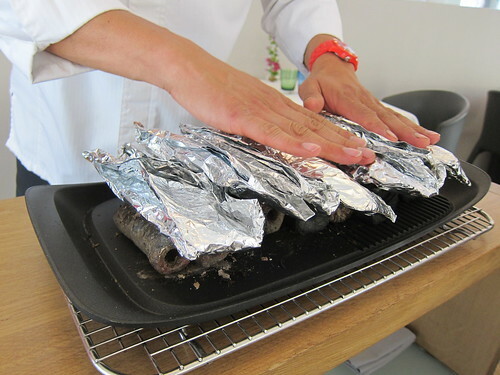 Sang attempts to correct the defaults of conventional Sushi by offering his own composition. Nori is replaced by a more tasty algae (forgot the name). 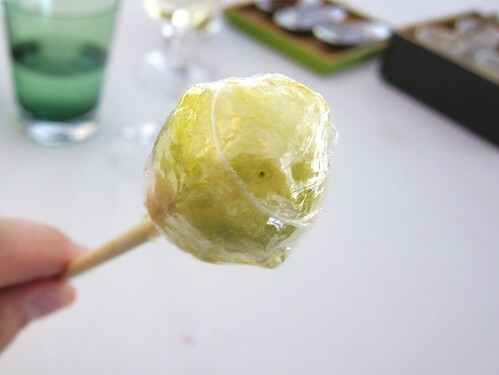 Then he simply extends the taste experience by serving it in a cigar-shaped gondola. 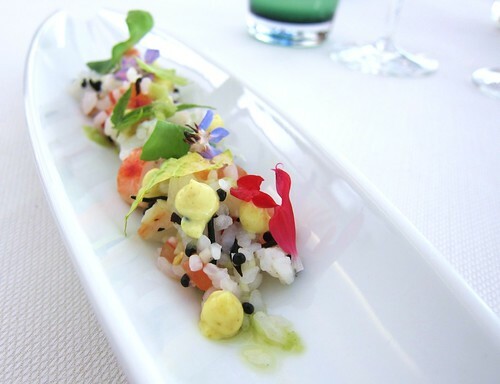 Successions of Verbena, King Crab, Wasabi cream, Ras-el-Hanout Mayonnaise, Cucumber, Avruga and Sorrel, plus this great dressing to the rice make it a never-ending firework. Who needs genuine sushi when you can have this? Pointillisme – or the return of Pollock. 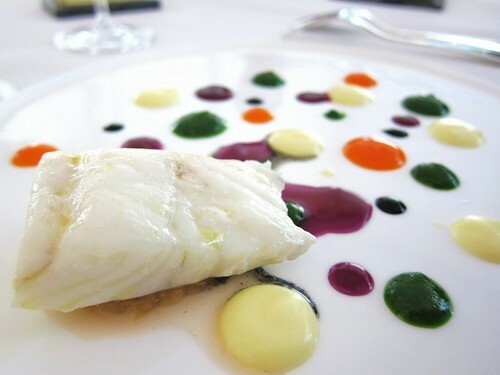 A beautiful piece of slightly brined and just cooked Turbot lying on a sour and fruity compote of Rhubarb. Then, dashes of beetroot, bellpepper and parsley that encourage to find your own flavour punctuation. One might think that this dish is just a visual gimmick, but all these flavor combinations work so well, you don’t want this artsy course to ever stop. 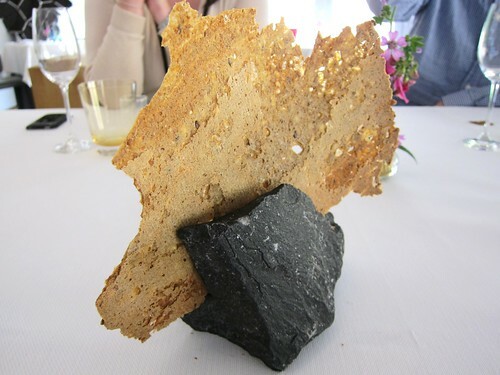 This is by the way Sang’s new interpretation of his famous Pollock dish (couldn’t find a picture). .. that found its response in a special Belgian lambic beer. 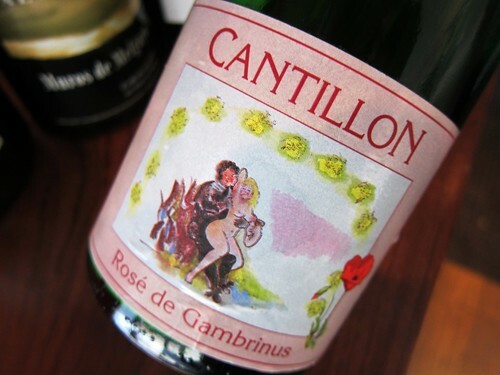 The Rosé de Gambrinus by Cantillon is fermented with raspberries and shows extremly tart and acidic, very hard to recognize as beer. 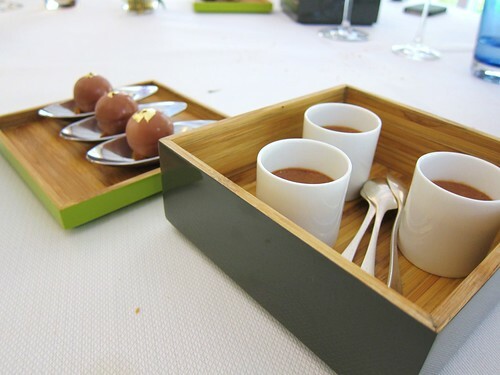 A pairing out of the ordinary that works..
Local– a pigeonneau from Jean Yves Bruyerre in Waret . Perfect cooking of the bird, one leg actually coated with Asian spices and soy (mmmh! ), fried onions, grilled peppers, some broccoli: a harmonious and very gourmand ensemble. So far in my young life, this is the most satisfactory pigeonneau dish I’ve had – The bird isn’t treated like a star ingredient that is alone on the red carpet and has to convince on its own but actually paired with ingredients that complement just so well and make it “yummy”. Bravo! And it is paired with a Belgian red wine made with the two varietals Pinotin and Cabertin. Charming. … Sake! 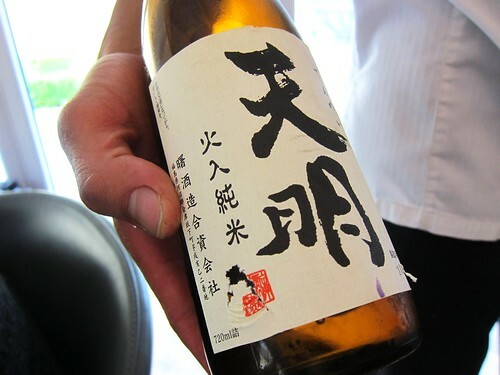 What an unexpected and sensational combination where the Sansho-pepper enters a passionate dialogue with the fresh complexity of the Sake! 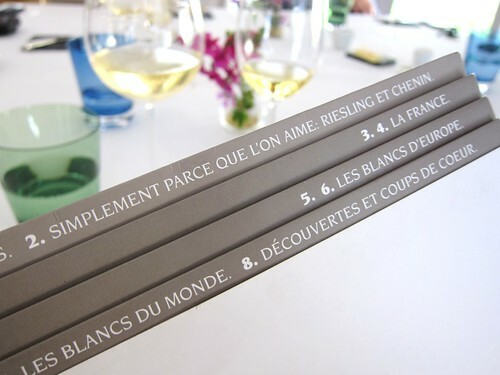 And the winegeek and blindtaster within me says: grandiose! These are the kind of food and drink pairing moments that make me happy! 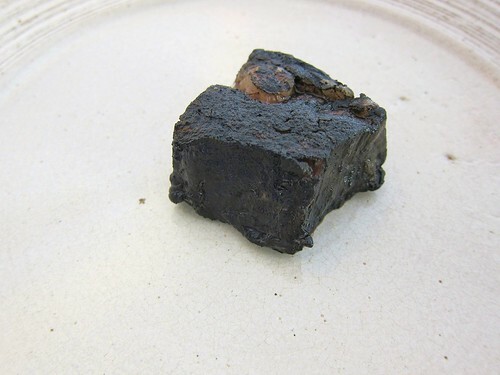 Then arrives the main Wagyu, lying like a piece of charcoal on our plates. Black because of Sepia ink and flavored with ashes of hay and liquorice. Subtile and rich at the same time. Next to it, just a hint of soy sauce reduction. 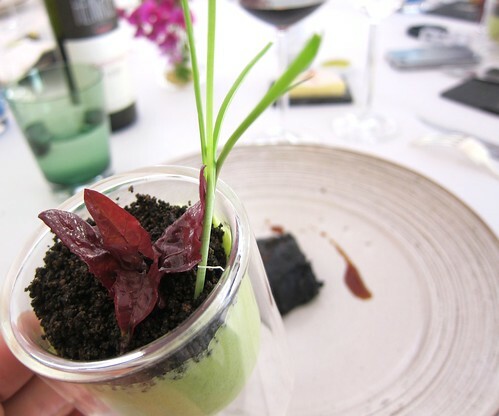 In a glass a potato in herbs cream, topped with “earth” made of black olives: lucious. 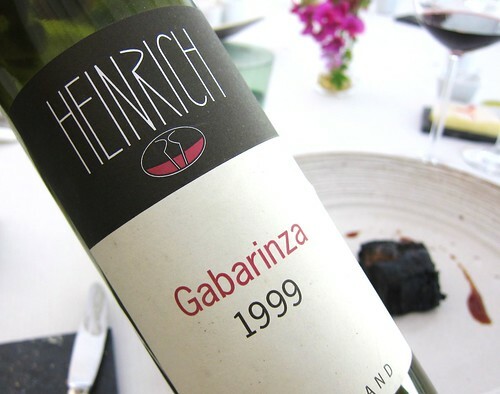 As a wine-pairng a 1999 Gabarinza by Gernot Heinrich from Neusiedlersee in Austria served blind. 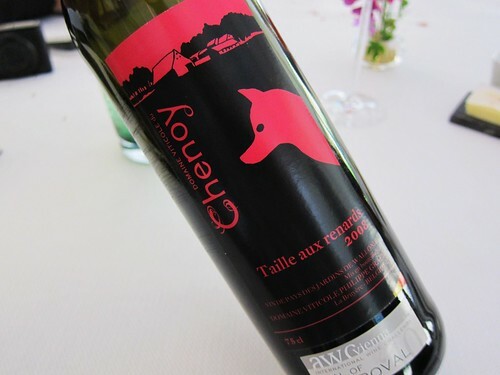 The closest guess we come up with is “Swiss Gamay”.. 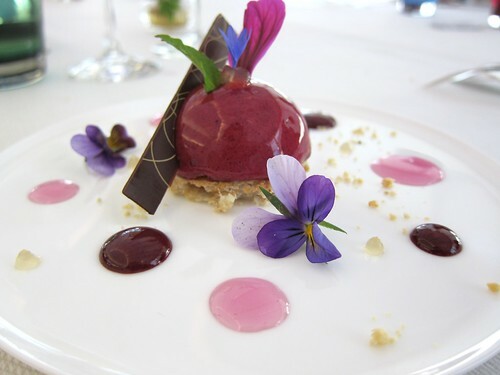 Flowers and Fruits – Blackcurrant mousse, violet icing, peanut biscuit. Visually sublime and equally delicious. C’est la rose… l’important – A composition around the rose. 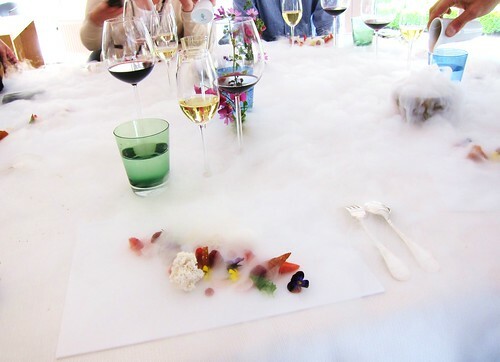 crystalized rose, spheriphied lychee, rose-water sprayed above our heads and lots of liquid nitrogen smoke. tasty and very poetic. A grande finale! 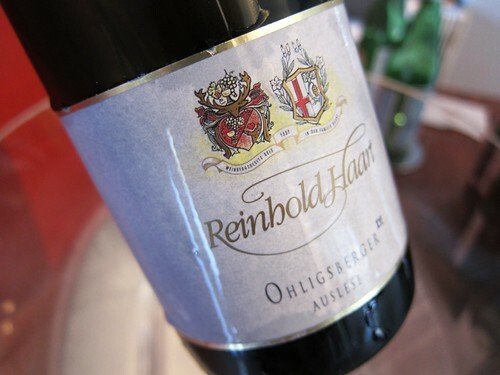 2006 Rheinholt Haart Ohligsberger Auslese, dessert Riesling. Now that was a quick lunch! 2 or 3 courses, right? Still can’t believe how generously well we’ve been treated! And what more can I add to the lines I already wrote at the beginning of this post? Well, I can only reconfirm them. 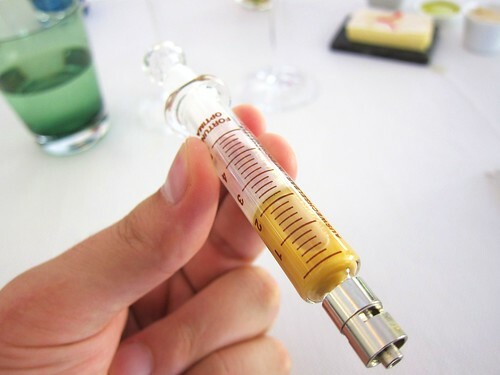 The molecular part is used with great measure, and on the other hand combined with a cuisine full of natural ingredients – which makes me think that we probably have a new genre here which we could maybe call natural molecular? Sang Hoon Degeimbre is somehow emblematic of a new generation of molecular chefs, who are employing these techniques with a lot of thought and discretion, but on the other hand it is also hard to pigeonhole him and putting a label on his cuisine like that. Actually one has to blank out all the molecular talk and concentrate on his style which is truly unique and very personal. It is a cuisine full of vivacity and colors. It is playful and dynamic, even interactive. And at the same time it is precise and meticulous. And of course: very tasty. And as for his very personal style, the Asian influence, I have to say that Sang is setting new benchmarks for fusion cooking. His style brought back all my good fusion food memories and just topped them. Be it one of my first such kind of experience with restaurant Sumile in NY (here’s the ancient review)we visited a long time ago in 2005 or the recent visit at the very ambitious Tippling club in Singapore. 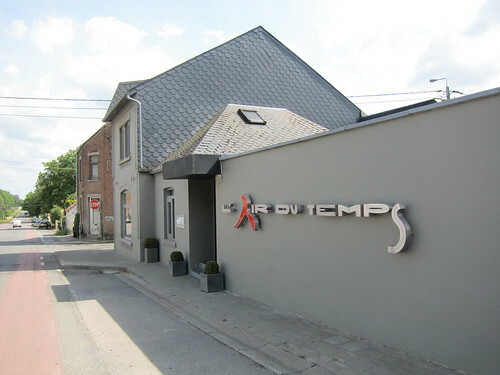 The latter also employs molecular cooking equipment, but doesn’t quite reach the level of refinment of l’Air Du Temps. Sang Hoon has a sense for local European /Belgian ingredients, classic and molecular cooking, subtle Asian cooking techniques that make him a unique personality on the European restaurant landscape. 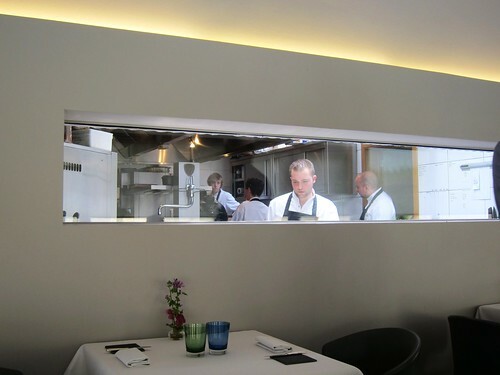 And therefore I believe his 2 Michelin stars are very well deserved and I am quite curious (and optimistic) of what is yet to come. And believe it or not, while Sang might be some kind of star chef in Belgium, he is still rather unkown outside the borders, which is a pity. So go pay a visit, you won’t regret it. So thanks a lot Sang and GOT for this great lunch! 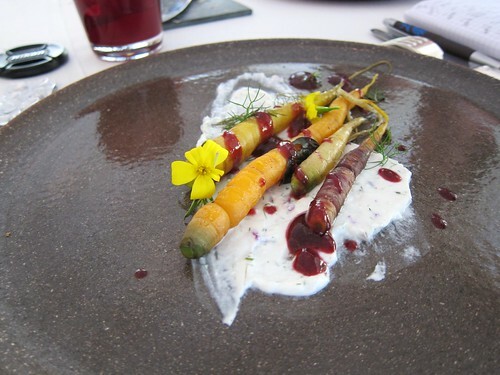 PS: again, for sublime pictures of this meal, check Stéphanie’s blog.